The winningest skipper in team history, Greg Tagert returns for his 12th season with Gary SouthShore. 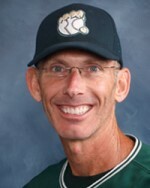 Having led the RailCats to the 2013 American Association crown, Tagert has three championship titles along with two Manager of the Year awards. Tagert, 50, arrived in Northwest Indiana in 2005, taking over a team that had set a league record for losses the previous season. His impact was immediate as the RailCats made the playoffs that season and won back-to-back five game series to win the Northern League Championship. After taking the RailCats to the brink of a title in 2006, the 2007 Gary SouthShore club collected a 58-38 regular season record and went on to win the title in another dramatic five-game series. Tagert won his 700th career game in 2010. Originally from Vacaville, Calif., Tagert worked as a pitching coach for the University of New Mexico in 1988 and an associate scout for the Detroit Tigers in 1993-94. Tagert was a pitcher at San Francisco State University.